Upon arrival, I started at Dutcher Crossing, which is actually in Geyserville as opposed to Healdsburg (not in the video). I met up with the proprietor, Debra Mathy, and her dog Dutchess (aptly named dog, who is continuously attached to her side). She dedicated the winery to her late father, who had just passed 3 months before the opening of her vineyard. You’ll note their trademark high wheel bicycle in their tasting room inspired the one on their wine labels. 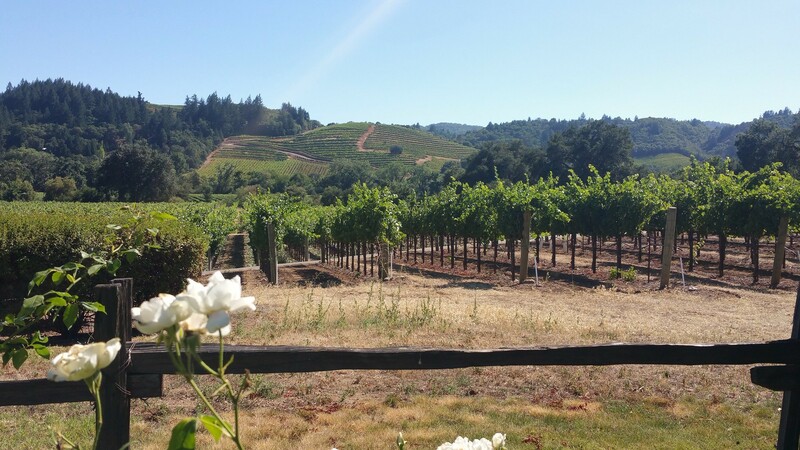 They source wine from select, nearby vineyards to help create distinct blends. You can choose from three levels of wine clubs (Cellar, Founder’s and Proprietor’s) for just the right level of participation for you. 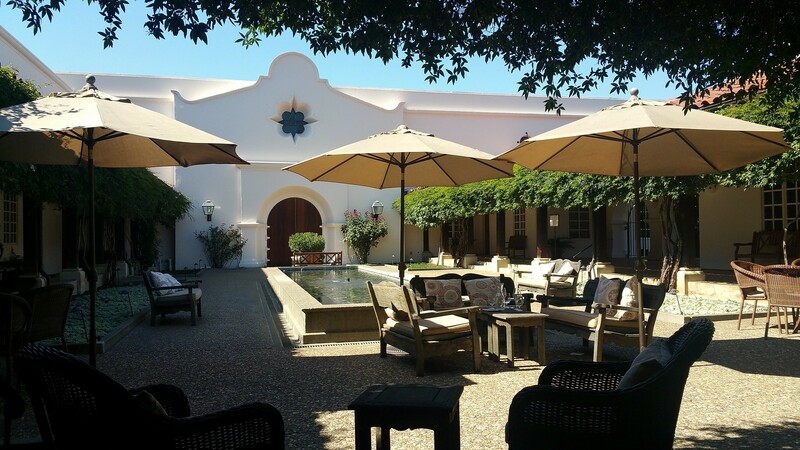 We tasted award-winning wines such as their 2015 Sauvignon Blanc, 2014 Maboroshi Reserve Pinot Noir Barrel Select and 2012 Taylor Reserve Cabernet Sauvignon. 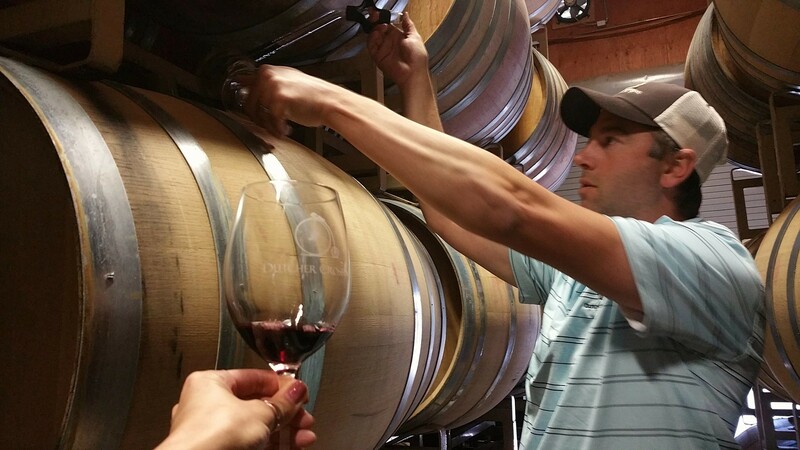 Then, we went into the cave to have some barrel samples of select Zinfandel barrels. Divine. I got a little tour around the vineyard itself via a ride on the mule (it’s motorized — not an actual donkey-horse hybrid animal) and learned a few things about the patterns of the grapes as they grow, what’s healthy and what’s not. After Dutcher Crossing, I headed to Amista Vineyards to co-host and attend my very first #instameet !! Spencer Spellman of Whisky Tango Globe Trot was the other host, bringing his NorCal influencer big guns to this event. 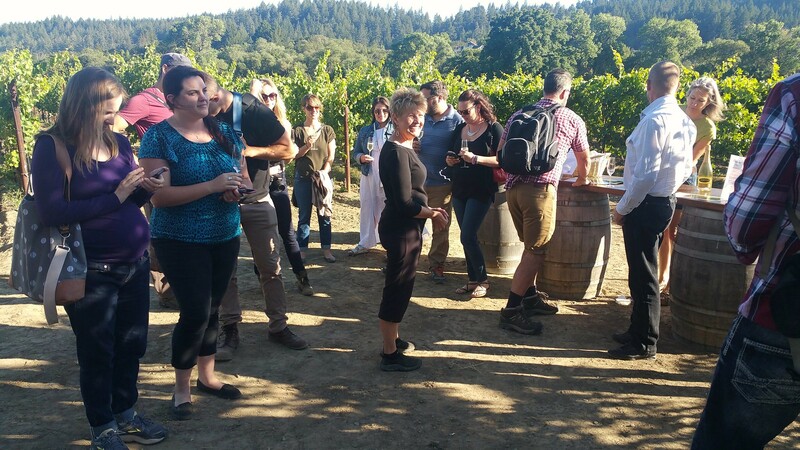 We got to cruise throughout Amista’s beautiful grounds, tasting different wines by individual winemakers at tables stationed throughout the winery. Participating winemakers included Geyser Peak in Alexander Valley, Frick Winery (a tiny winery specializing in rare Rhône varietals and unusual blends — super impressive), Rued Winery (small batch winery from a Swiss family), and, of course, the omnipresent Dutcher Crossing. The instameet was a great way to bring wine and social media people together for a scenic multi-wine tasting at sunset. 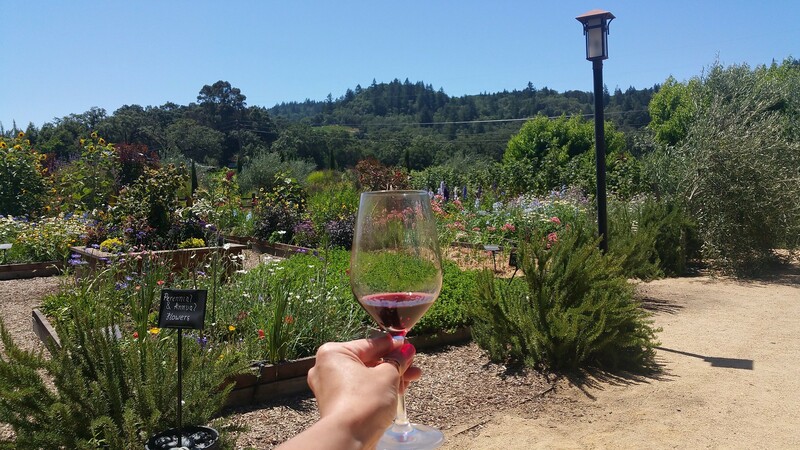 I couldn’t think of a more enjoyable way to taste a region’s wines all in the same place. The walk between each station was perfect for getting the blood going but somewhat digesting the wine, as well. As for the next 3 vineyards, you can get right to the video. They include the biodynamic farm and vineyard Quivira. That garden is a sight in itself to behold, with plants I’ve never heard of before. I got the lowdown on how the entire property is 100% sustainable, got to throw scraps to their chickens and taste the charcuterie made from heritage pigs raised a few feet away. That was followed by a multi-course Cicheti tasting with wine pairing inside their impressive and entertainment-worthy wine cave at Simoncini Vineyards. It’s a relatively new property, with a state-of-the-art wine cave built into a hill. They’re building upon the Italian tradition of small plates and pairing them with their delicious wines in a cool atmosphere. The wine cave is often used for events — which is fitting since it’s the only wine cave I’ve seen with a piano. My day ended with yet another multi-course dinner at Michel Schlumberger Winery, where Executive Chef Johnny Gall is doing exciting things pairing his food with and even utlizing the property’s wines in his cooking. 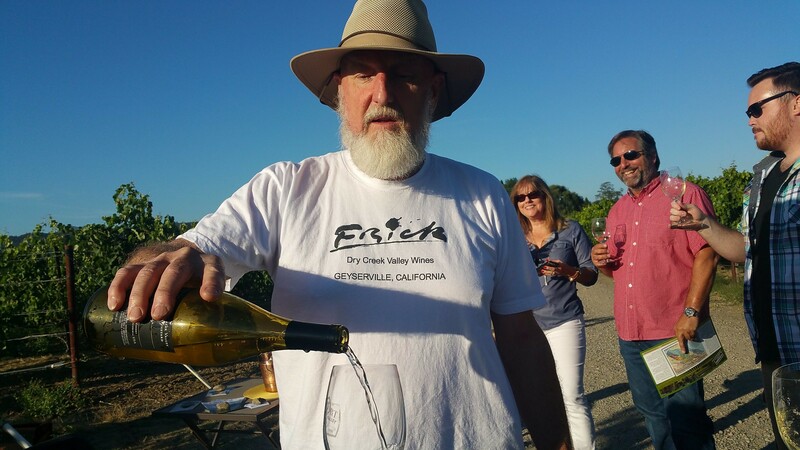 There’s more to come from Dry Creek Valley. Until then, Happy Wine Wednesday! This entry was posted in Pairings, Travel, wine, Wine Country and tagged #instameet, #SonomaChat, #winewednesday, Amista Vineyards, Dry Creek Valley, Dutcher Crossing, Executive Chef, Geyserville, Healdsburg, Johnny Gall, Michel Schlumberger Winery, NorCal, Quivira Vineyards, Rhone style, sauvignon blanc, Simoncini Vineyards, Sonoma County, wine cave, wine country, wine pairing, wines, zinfandel. Bookmark the permalink.